Something magical happens in a one pot meal like sausage with sauerkraut and apples. The flavors build on one another and co-mingle to create a delicious dish. The acidic sauerkraut paired with the sweet and buttery apples and the meaty sausage is the perfect balance of flavors. If you are lucky enough to have homemade sauerkraut on hand, absolutely use it for this meal. Store bought sauerkraut will also work just fine too. 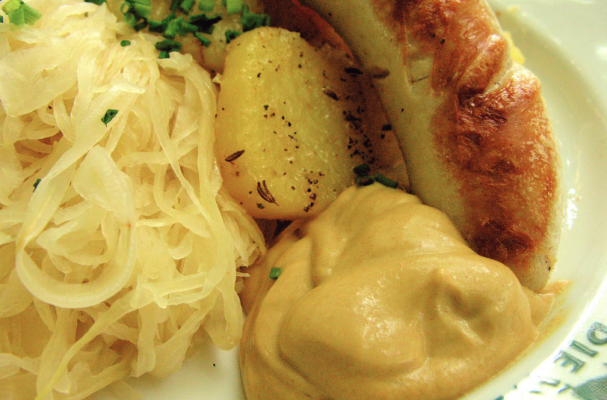 Serve this meal with your favorite German beer and a crusty bread. Step 1: Heat a large skillet over medium heat and add both the caraway seeds and celery seeds. Toast the spices until fragrant, about 1 to 2 minutes. Remove from heat so that they do not burn. Transfer the spices to a small bowl and set aside. Step 2: Place the pan back on the heat and melt two tablespoons unsalted butter with olive oil. Add the apples and saute until softened, about 5 to 7 minutes. Season with salt and freshly cracked black pepper to taste. Remover from pan. Step 3: Return the skillet to the heat again and add remaining tablespoon olive oil to skillet. Sear the fresh sausages on all sides until golden brown, 3 to 5 minutes per side. Add toasted celery seeds and caraway seeds, sauerkraut, and stock. Bring the mixture to a simmer and continue to cook the sausages, covered, until they are cooked through, about 10 to 15 minutes. Remove lid and gently mix in apples, cider vinegar, and remaining tablespoon of butter. Cook, tossing, until some of the liquid has evaporated and apples are warm, about 3 to 5 minutes. Taste and adjust seasoning as necessary. Serve with mustard for dipping. *Free free to substitute half of the chicken stock with a richly flavored beer, particularly ones with notes of ginger or nutmeg.